Fashion illustration is essential for fashion designers to facilitate the expression of ideas in their work. This evening course is for anyone that wants to explore the area of fashion illustration and observational drawing of the body. You will be guided through multiple drawing and mark making techniques that embrace unconventional processes and give a unique understanding of what makes a successful fashion illustration. You will create illustrations inspired by the V&A’s Europe 1600 - 1815 and Fashion galleries whilst observing a live fashion model. Christopher Kelly is a designer and maker who has built a reputable career across production design, fashion and illustration. Using raw, unconventional, drawing techniques, Kelly has honed the craft of illustration as a tool for communication in all of his design work. For the past 5 years Kelly has taught at the prestigious art school Central Saint Martins; where he encourages new young designers to forget conventional methods of drawing, and instead aims to develop a more unique and personal style of illustration. After 10 years in the fashion industry, building his own fashion label, Christopher Kelly is now one half of the design duo, C&AB Studios, a production design studio working with companies such as Greenpeace, Simon Costin and The Independent. 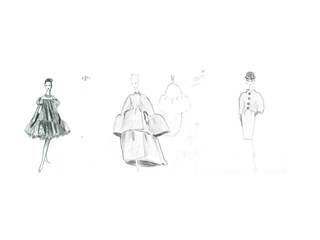 Taking inspiration from the V&A's collections and drawing using a live model, you will learn how to develop innovative fashion illustration techniques.